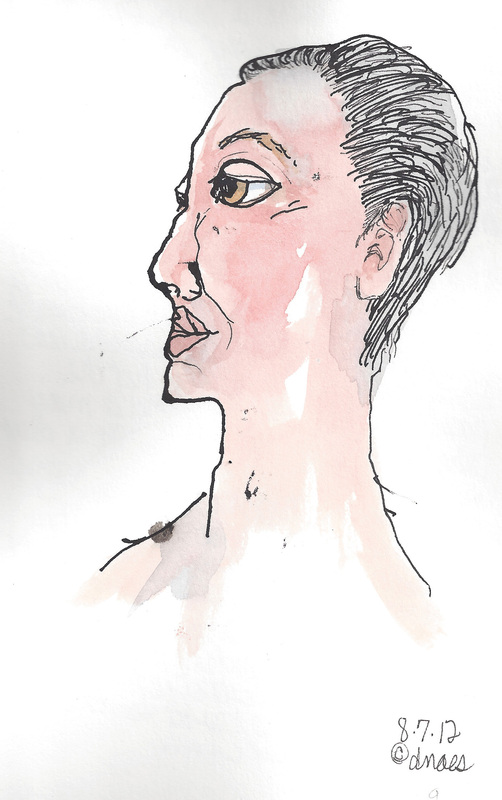 Oh wow, I’ve been busy for a change and as I struggle with the balance of working on a commissioned piece I’ve thought about all the freedom I have (normally) to just sketch & play when I want to ….. most of each day. I really haven’t kept up with my normal Everyday Matter’s group & missed 2 weeks of Illustration Friday challenges (oh no), but I have indeed been sketching everyday no matter what. So I just decided to at least share the dancing of my pen, and acknowledge that it is truly hard to work everything in but it is really important for me to take a little time NO MATTER what else to sketch just for myself. I hope that you take time too! 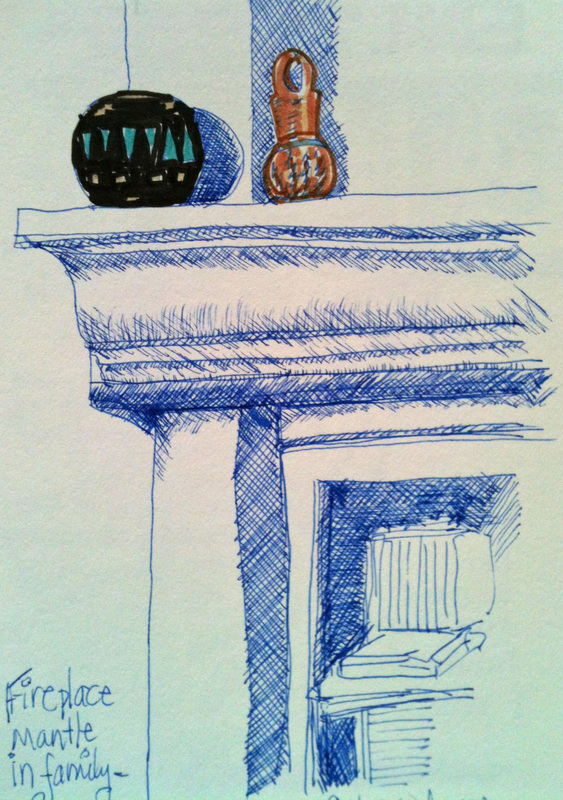 The fireplace mantle in my family room…watching TV? Using up the blue ink? 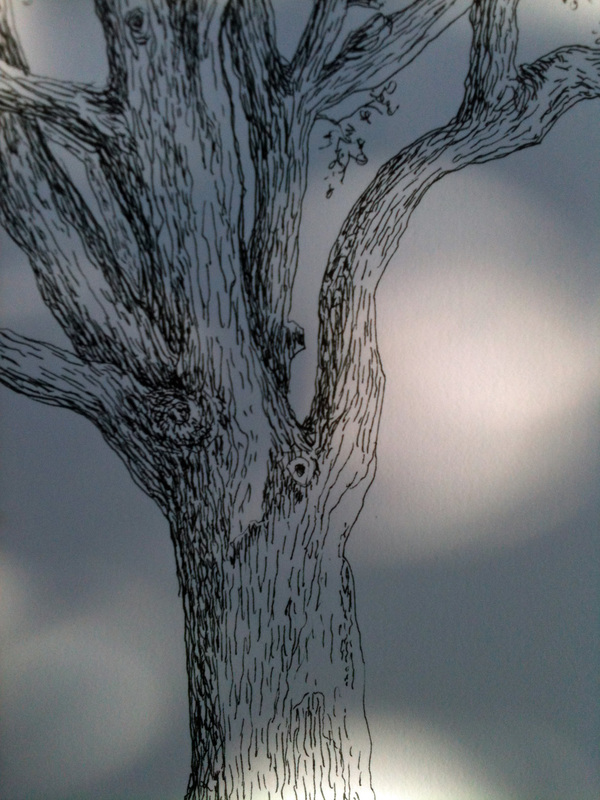 Old Oak in the Park…listening to the birds! 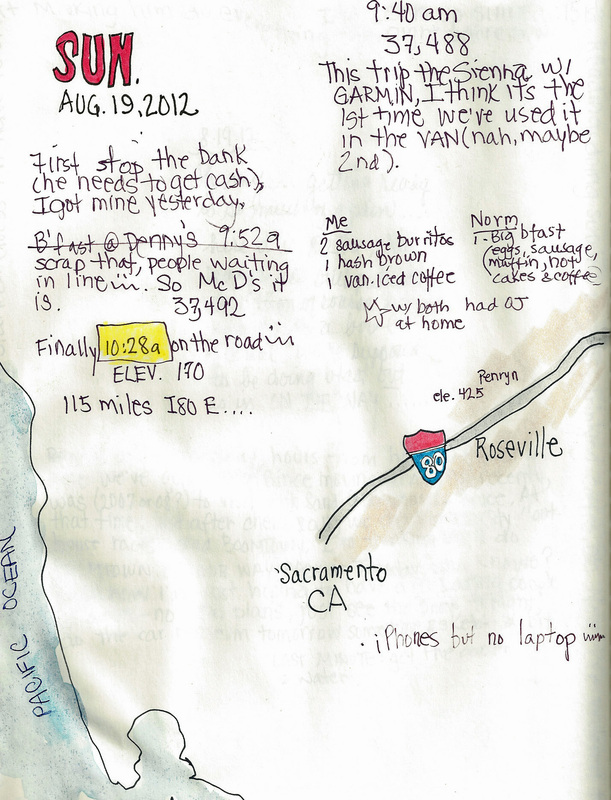 Travel Journaling: Reno or ‘bust! Just completed a short trip into Reno, NV! 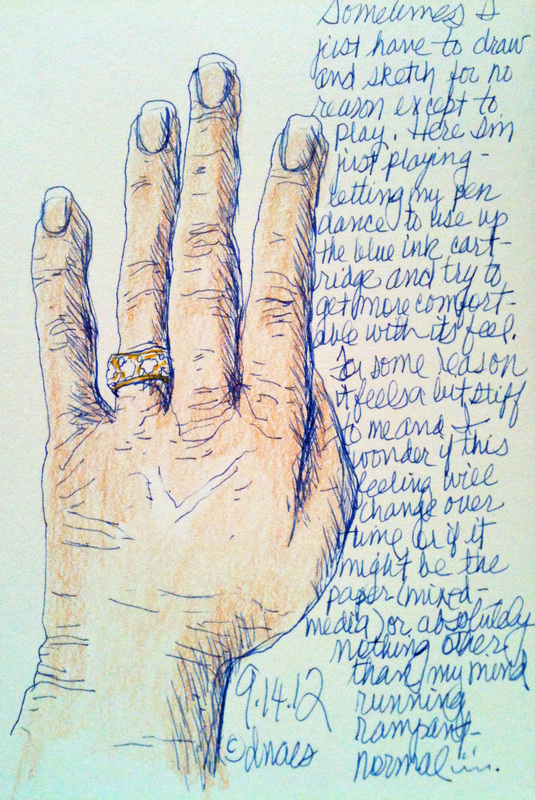 I of course reverted to my standard ‘dairy style’ of journaling the tid-bits of the day on the fly. 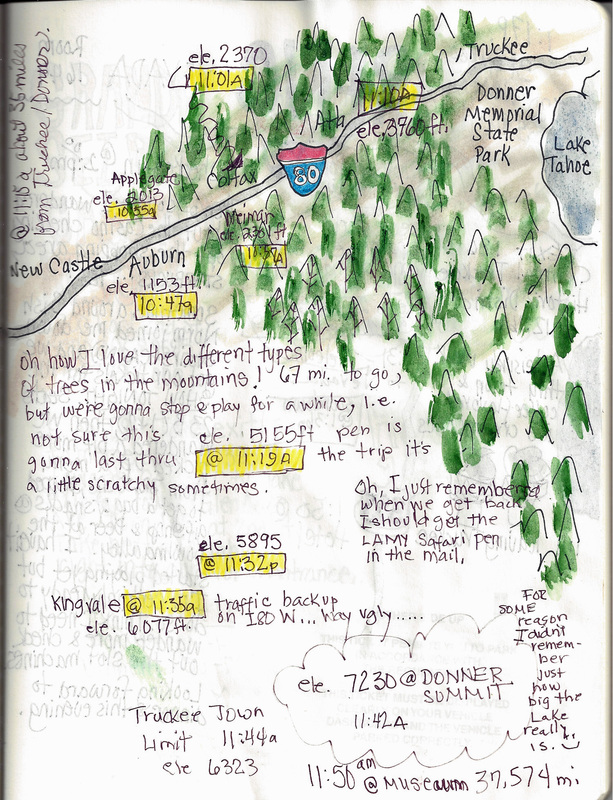 I love documenting the daily minutia, and thus started out with a 2 page spread with a hand drawn map to fill in as we drove along. 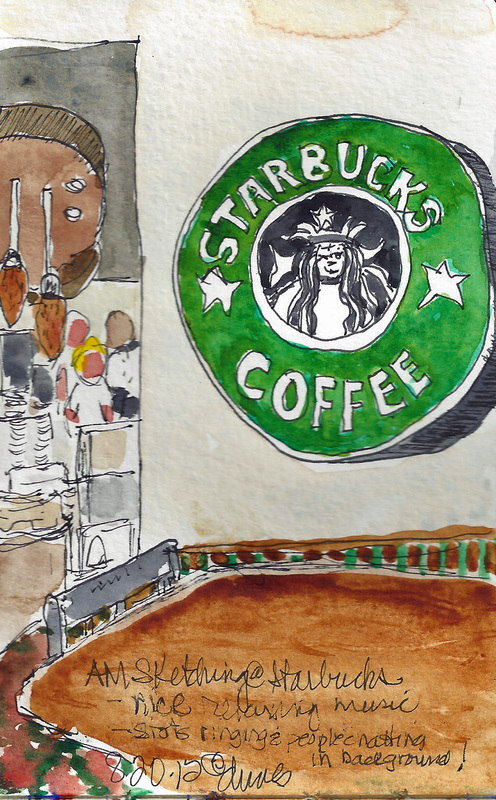 During our stay at the Grand Sierra Casino & Resort, I did several sketches in the early morning hours near the Starbucks 🙂 of course, while I sipped on my morning latte and listened to the great background music! 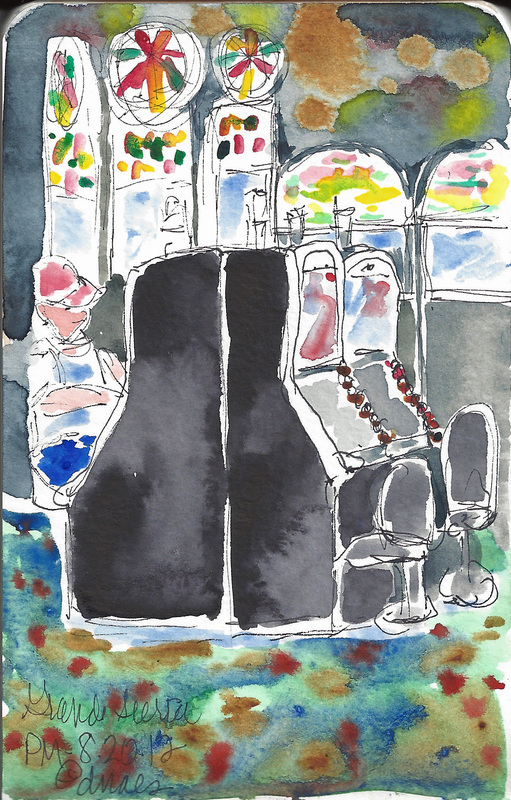 I had fun sketching folks, but often they catch on and try to cover their faces….so, I gave up on the folks and just did sketches of the immediate area. 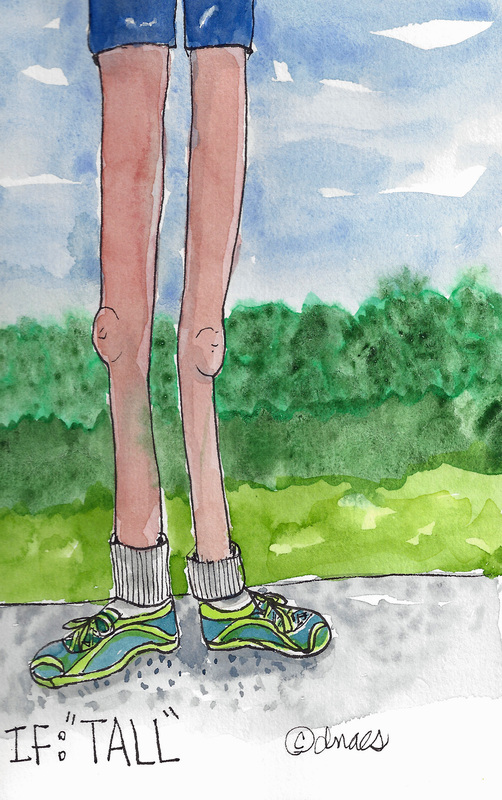 I painted them in watercolor after we returned home. I was thrilled to stop in Boomtown on the way back. I actually recouped my previous losses. 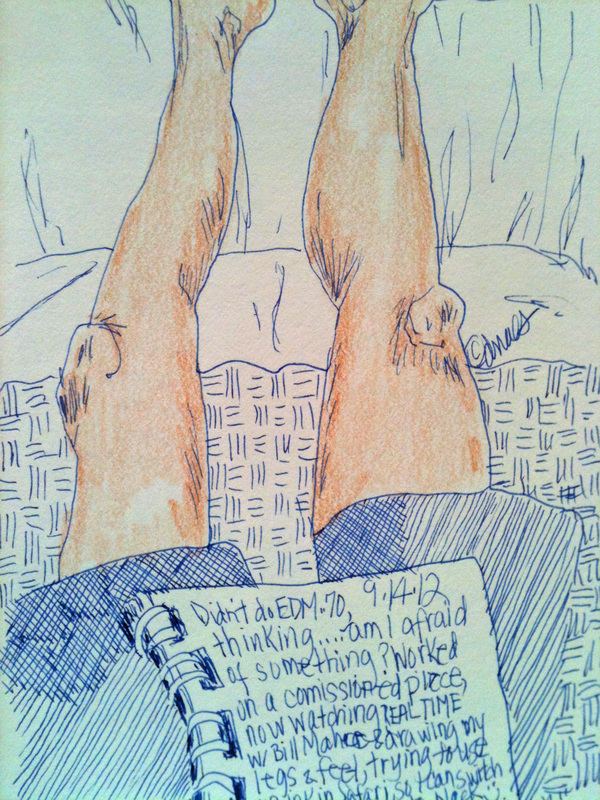 Then, on the way back home a bit of sketching in the van while Norm drove. We really had a great trip, nice & relaxing and by the way if you ever make a trip there make sure you do the National Automobile Museum. It’s awesome! Have a great day, and keep sketching my friends! 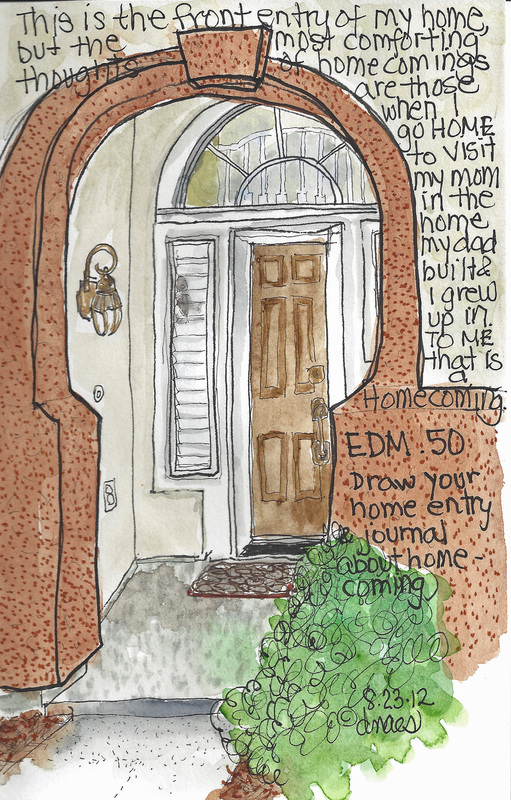 ART Journaling or Travel Journaling ‘what’s the difference’? 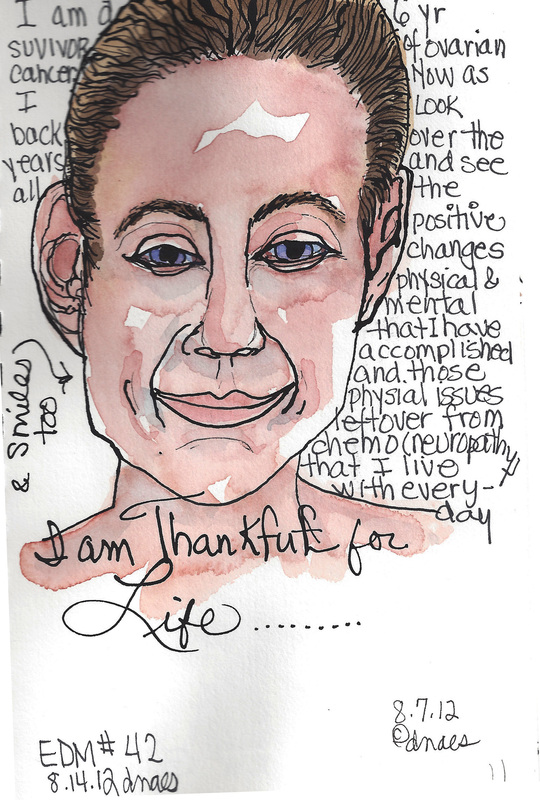 Over the past week I’ve been busy working on my background ‘faces’ project and began thinking about how the differences in process are directly connected to ‘my personal journey’. 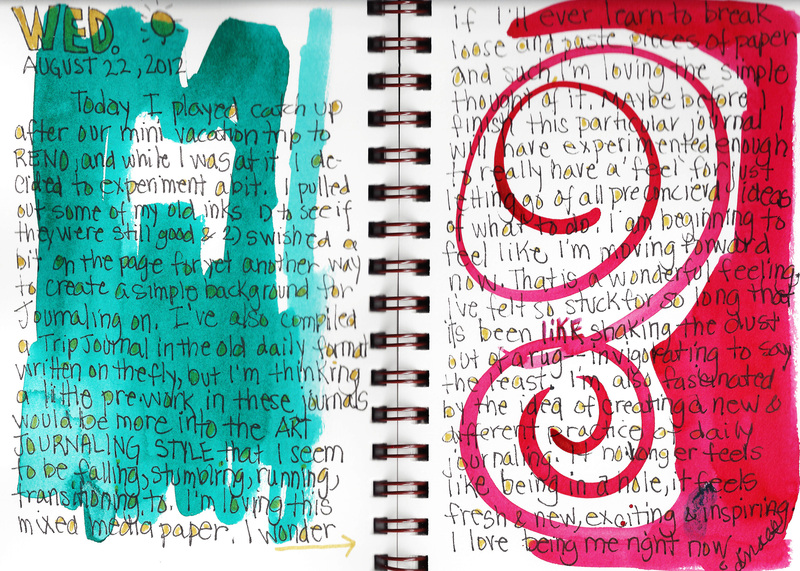 As I observed the changes in my habits (ha) first I realized that ANY change can be just the boost you need to rekindle the fire in your journaling. In this case fire is good, and I believe these changes have helped me become more creative. 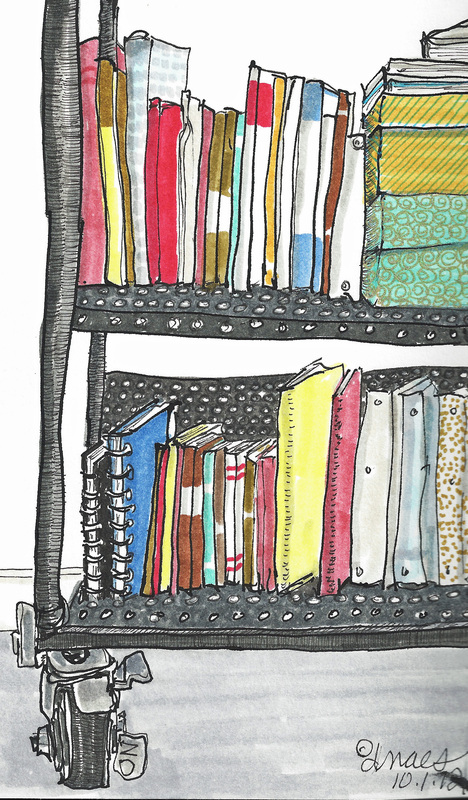 Although now, instead of 1 journal with everything in it, I have again slipped back into separate journals. It seems to be something I do periodically, really don’t have a clue as to why. A background page ‘face’ painted & ready to go! 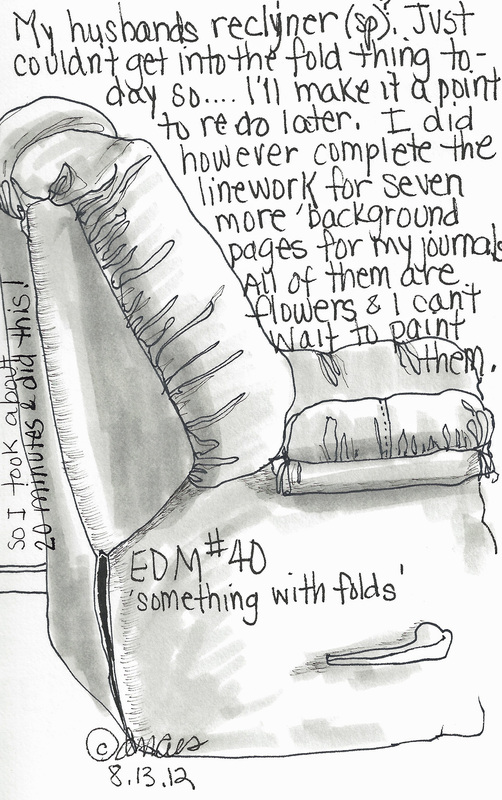 One journal now is more or less just for writing, and it’s not really up to date. It’s just there in case I decide to write more extensively, and at the moment I have 3 different ART journals going with mixes of the Everyday Matters Challenges, Illustration Friday works, and many, many faces all in various degrees of completion to use for backgrounds. I’m thinking, ah, this craziness must be because we haven’t taken a road trip in a while, I’ll know soon because we’re getting ready for one. 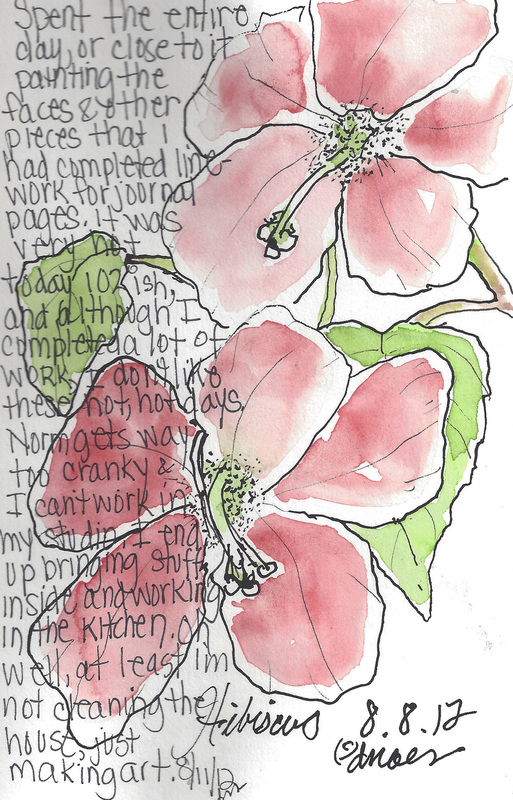 So, I now recognize that for me the difference truly is in the process I use and preparing backgrounds to journal INTO for me is ART JOURNALING, and doing illustrative journaling ‘on the go’, as it happens or where I am at the time seems to enable me to document my life and thoughts more along the TRAVEL JOURNALING path. Well at least I think I have it isolated in my mine anyway. I hope you enjoy, and maybe try making some for yourself. It’s the little sparks that start the fire. 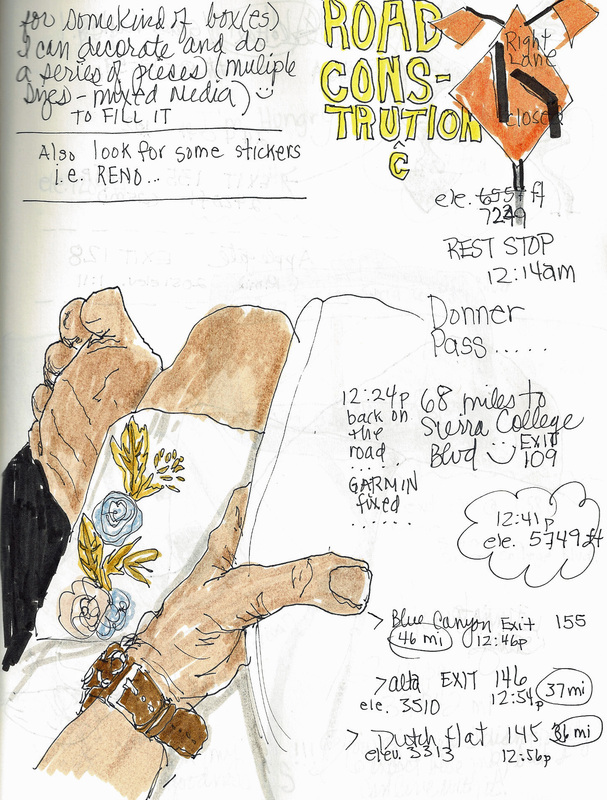 I’m looking forward to this upcoming road trip because I think it will validate my current thoughts, and of course my TRAVEL JOURNAL will become fodder for an upcoming entry. Keep playing, it’s good for your soul.